Meet Simeon from Socialnet365.com – one of the three winners in 3Challenge Seed (Season 4) who will be competing for our big prize in just 3 months’ time. 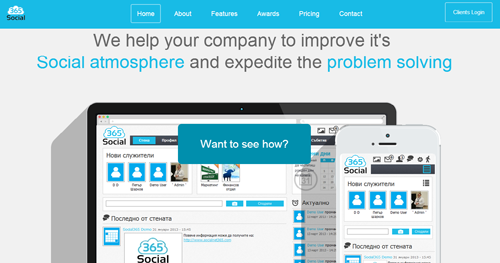 Social365 is a corporate social intranet solution, which helps companies improve their social collaboration, team events, easily organizing their teams and finding employees with perfect skills. Simeon Sofroniev holds a Bachelor Degree in Computers science and one in IT communications, and has worked in the IT sector for more than 7 years. He has lived and worked in Germany and Netherlands for one of the biggest IT companies there. He is one of the Top 20 young entrepreneurs for 2011 based on the “NEXT Generation” chart by Capital. He has several successful startup projects for the past 3 years (like MyTeam.bg) and now he is ready to go into the deep waters of the B2B solutions. Daniel Yordanov is the Software architect and senior developer of the project and has more than 7 years of experience in complex software solutions for Enterprises. He is also a co-founder of MyTeam.bg. Can you tell us a bit more about your project – what is it and what value does it bring to your customers? Simeon: These days most companies worldwide realize that social collaboration and finding fast and easy solutions for daily basic problems at work, or finding the best employee for certain task, is priceless. That’s why the market trends for Social Enterprise 2.0 solutions, such as Social365, is estimated to be $4.6 billion for 2013. So our solution, Social365, is coming to the market in the right time and it provides a multi-lingual, easy-to-use and easily customizable platform for the end client. Simeon: Our solution helps SMEs dealing with problems like: lack of time for solving issues and searching internet for solutions; problems with finding employees with certain skills; lack of event platform for organizing team buildings, trainings, courses, presentations and etc. ; missing tools for booking of cars/rooms; lack of clear overview of the team/company structure; lack of all-in-one platform for social intranet communication, etc. How was the idea behind your project born? 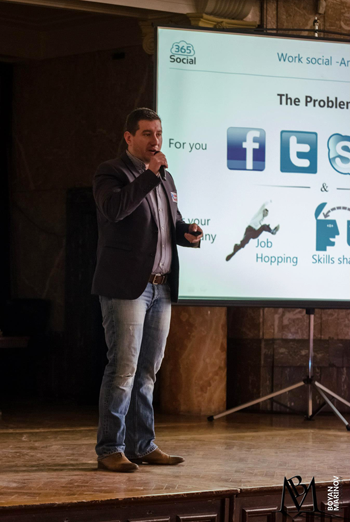 Simeon: My previous project, MyTeam.bg, is a portal that helps people doing sports at professional and amateur level to organize themselves easily, to start their own team and participate in sport events. Then we realized that this problem also appears in the companies we worked for and that there are no solutions with competitive pricing, multi-lingual, with easy user experience and customization model. Then we started working in that direction and last month we launched our Final version of the Platform: Social365. Simeon: We’ve been working together for more than 5 years as colleagues and then as co-founders of MyTeam.bg and now we continue with our new project Social365. We have been dealing with a lot of problems and technologies together, releasing different versions to be on the top of the web trends, as always. What is your motivation for developing this project? Simeon: We believe that our solution will be one of the next steps in the enterprise solutions market in most of the companies in the region. Also our competitive price range and module-based solution, as a SaaS and On-premise solution model, will give us the chance to easily become leaders in this market niche. Tell us a little bit more about what you’ve achieved so far and what lays ahead for you? Simeon: As I mentioned, we launched our final version of the product with version 1.0 and it’s ready to be implemented to any potential customer, for instance: company, community, school, organization, etc. 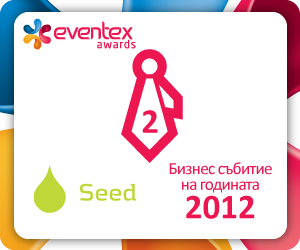 Currently, we have 2 early adopters of the product and we are negotiating with 2 other potential clients. We are also in the middle of signing contracts with some of the biggest IT companies in Bulgaria to become our reseller partners. Who is your product most useful for? What exactly would they get? Simeon: Imagine that you are working in a company, but you don’t know what are the skills and interests of the person next to your desk. You also don’t know what the next company’s events and latest news are. Now imagine that you’re solving a problem at work and you are searching google for more than an hour and you are sure that some of your colleagues had this problem before, but you don’t know whom exactly to ask. On the other hand, if you are a Project manager and you are looking for the best employee for your next project, but there is no easy way to know who has the particular skills… And many more problems. So here comes our solution that helps all this to be solved in one place between employees that are friends and like their company. What tip would you give your potential customer that they can implement tomorrow? Can you share an important entrepreneurship lesson you’ve learnt while developing your project? Simeon: You should always love and believe in your project no matter what other people say. Even if you realize that it’s not the best one, you can always update it and will be one step forward of all others that are just beginning with a similar idea. What is your startup’s ‘secret sauce’? Simeon: Be patient, innovative and persistent. How did the 3Challenge experience help you in developing your project so far? Simeon: The people in the team behind the challenge are some of the most enthusiastic young people I’ve met for the last 4 years in the startup stage in Bulgaria, which makes us believe that the right way for us is to create something new and innovative. Give us your call to action! What do you need now? Who could help you and how? Simeon: We are currently looking for strategic reseller partners, potential customers and of course funding or business angels in order to be able to emerge on the International market. We believe we have something to show to the Companies abroad in terms of dealing with their daily working/social problems.